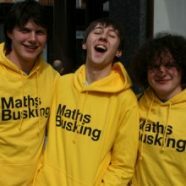 Maths Busking aims to show the public the surprising and fascinating side of mathematics through the medium of street performance. I had had a training day last month and worryingly for me that’s considered enough to go out on the streets. Our team of about ten, consisting of undergraduate and postgraduate maths students, teachers, sixth formers and various university types such as me and my colleague Ruth, was highly visible as you can see from the picture at the top.The morning session was a hard, surprisingly not many people wanted to stop their shopping and do some maths. 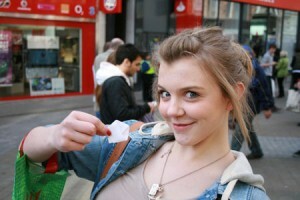 However, as I got better at approaching and performing I was able to show people how to make an emergency pentagon. The afternoon session was easier. 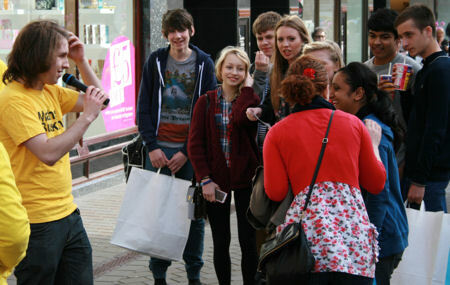 The sky was not so grey and stopping the good people of Leeds to show them some maths became more natural. The escapology routine called Zeeman’s Ropes was particularly popular. 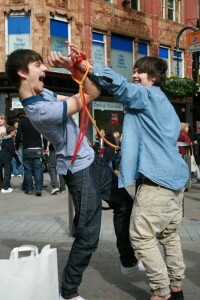 The day finished with a quick “show” which included mind reading and the chance to win ten pounds. 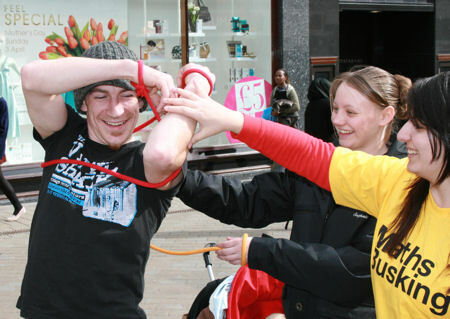 Thankfully Rufus, a highly experienced busker, successfully played the game of Nim so that he didn’t lose the money borrowed from me for the performance. No chance of your team bringing this roadshow to our town I suppose? (Weston-super-Mare). Pleasant climate, miles of sandy beach so plenty of room to prove Pythagoras’s Theorem and maybe most of Euclid, good restaurants, good walking/recreation in the Mendip Hills nearby. I have various friends from Church and work whom I’d direct straight to it! Are the Zeeman Ropes related to the Seven Bridges of Konigsburg by any chance? Ah well, it’s not my team – I was just trying out the idea of maths busking – so I can’t take them to your town. 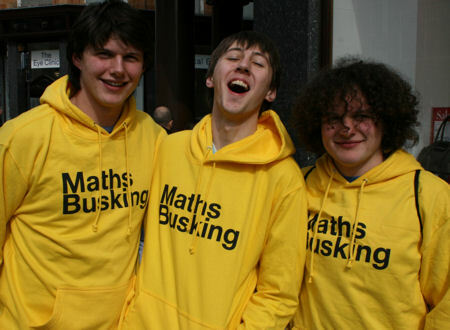 You can sometimes find out about events via the maths busking website but it’s not always up to date. The Zeeman Ropes are only related to the Bridges of Konigsberg in the sense that they both are to do with topology. They have different solutions methods!